The Department is dedicated to the mission of the University through excellence in teaching, preeminence in scholarship and research, and a commitment to effective leadership in professional service. These goals are achieved through: daily contact with professional and graduate students involving didactic lectures, group interactions, and individual mentoring; significant contributions to science through innovative research; and, leadership roles in professional activities within the University, among local and state agencies, and at the National/International level in professional and scientific societies. 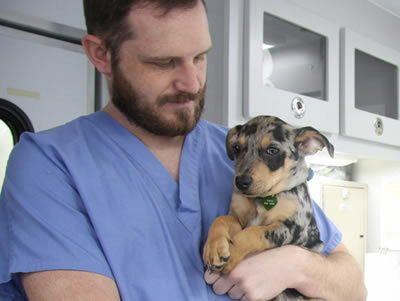 The Department of Veterinary Medicine and Surgery is the academic home of the Veterinary Health Center (VHC). The Department of Veterinary Pathobiology (VPB) was created by the mergers of the Departments of Veterinary Pathology and Veterinary Microbiology. VPB is an integral component of the College of Veterinary Medicine that provides a unique and critical link between the basic and clinical sciences. Our mission is to acquire, advance and disseminate knowledge in the fields of pathology, parasitology, microbiology, immunology, comparative medicine, genetics and related disciplines that will ultimately lead to better diagnosis, control and prevention of animal and human diseases and to provide training of the next generation of researcher scientists. We integrate this knowledge into the teaching, research and service programs within the college and across our campus.